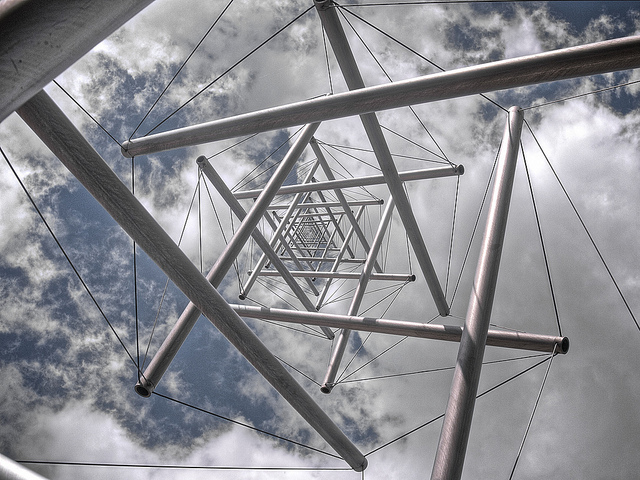 In this post Leena reflects on what she has learned from practicing the Tensegrity Repair Series, and shares a bit more about what the term “tensegrity” means and where it comes from. I continued doing what I was doing despited the feeling that I progressively feeling less balanced and stable, despite my best intentions to practice with good alignment and a balance of strength and stretch. Finally, I injured my shoulder in an inversion, and the pain persisted and increased for 6 months despite my best efforts to rehabilitate and seek good medical care. Finally, I slowed my yoga asana practice way down. I eventually took several weeks off, and then started back slowly with just the Tensegrity Repair Series, and then added asana back little by little. After about a month of practicing the Series, I noticed my shoulder recovery taking a turn for the better. I’ve also noticed much improvement and greater awareness of my seated and standing posture, increased core strength and greater pelvic stability, decreased back pain, and balancing in handstand is getting so much more possible! Another bonus, over time, I’ve found the Series to have an incredibly calming and relaxing effect on my nervous system. I’m designing a 6-week course to teach the 20 exercises and it starts Thursday, September 11 at 6pm. Over the course of six weeks we will explore the 20 exercises in detail and learn some of the relevant anatomy principles behind them. This class is ideal for all levels of experience and is especially useful for those seeking to recover from imbalances due to injuries and overuse, restore pelvic strength after pregnancy, gain balanced flexibility, and improve overall posture and wellbeing. The 20 movements, most of which are done lying on your back, are highly accessible to different levels and abilities, but almost everyone will find areas of challenge for themselves as we refine our movements each week. You’ll leave each week with useful and simple practices you can do in a 15-30 minute home practice.